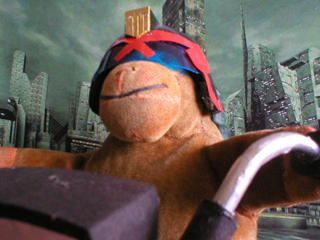 Every so often Mr Monkey visits the future worlds of 2000AD. While he's there he borrows a Megacity One judge's helmet from Judge Dredd and spends the afternoon randomly attacking passing citizens enforcing the firm but fair laws of the city. 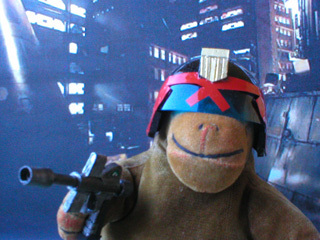 Mr Monkey's Megacity One Judge's helmet is mostly made from a plastic hemisphere that originally protected a hollow chocolate Christmas tree bauble and some thin plastic card. The visor is from translucent plastic, the shield from gold card and the red stripe is made from Fablon sticky-back plastic. His Lawgiver pistol is made from thick card, thin card, cartridge paper, foam board, and a biro barrel. His partial Lawmster bike is made of card, paper and thin plastic tubes.